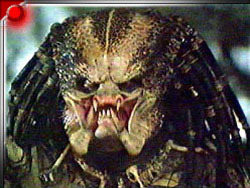 The Predator aliens are characterised by their trophy-hunting of other dangerous species for sport, including humans. Predators are large, sentient humanoid creatures who possess advanced technology such as active camouflage and energy weapons, and are capable of interstellar travel. The creature known as the Predator is a bipedal humanoid creature standing approximately 2.5 metres tall, with the average weight of a male being between 250 and 350 pounds. Most of their bulk is pure muscle with very little body fat, due to their predatory lifestyle and diet. Skin color is generally a pasty yellow or mottled with black spots, and their eye color is similarly yellow or green. 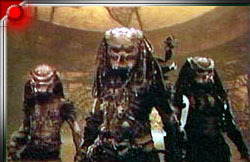 On their head the Predator have what appears to be the equivalent of human hair, resembling long black dreadlocks. While the Predator's body may seem humanoid in general, this cannot be said for its face - having been described as a "mutated crab" in appearance, the Predator possess very distinct facial features. The most prominent of these are four mandibles which protrude from, and surround, a smallish mouth filled with sharp teeth. These mandibles are used for communicating, much like a cat uses its tail to communicate its mood - although Predator also have a verbal language (consisting of growls, clicks and chirps), and are capable of mimicking other verbal languages to a degree. Biologically, Predators are much stronger and faster than an average human, and possess lightning quick reflexes and dexterity. Their blood is green with a phosphoresent quality which may have properties that protect them against the caustic effects of their favorite prey's blood. As far as sensory perceptions, it is believed that they are similar (but superior) to humans - and it is also a common practice for Predators to employ technology to further heighten their senses. And for environment, it appears that the Predators prefer hot and humid conditions with an atmosphere rich in nitrogen, no doubt due to evolution on their planet of origin. 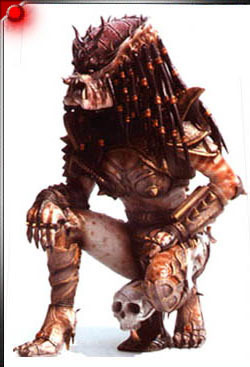 Predators are known as 'Yautja' in their own language. They have also been referred to as 'Hish', although this may be the name of a certain clan (or even breed) of Yautja. As for their biology, Yautja lifespan is many decades; sometimes as long as 300 years. This longevity suggests that sons live with their mothers for many of these years, as it would take longer for them to mature and fend for themselves. Daughters probably stay with their mothers, to eventually raise their own children and maintain Clan dominance. Individual females would probably birth every few decades and be very particular about the father, but keep no permanent pairing bonds. This would lead to very high competition amongst males. Males probably live in packs of generally unrelated males. In this atmosphere of high competition for breeding rights, there are many males who never get to breed. These frustrated males may turn on their subordinates. But the males who breed have proven themselves by hunting dangerous prey and gaining many impressive trophies. Another bonus is the admiration of their clan brothers - males hunt for status. However the social structure of the Yautja is not completely understood and they may well be a very civilised race, despite the common belief. Predator culture in general is based on the concept of The Hunt. Whereas humans on earth were agrarian, the Predators never stayed in just one place. Their culture revolves around the concept of hunting and stalking prey. Very similar to a pack mentality, the strongest and most efficient member of the Clan is the leader. This alpha male controls the actions of the group. The Predators appear to value other predatory species as the most challenging targets - this would also explain their preference for hunting humans, another highly successful predatory species. As a rite of passage into adulthood, each young male Predator trained for the hunt (UNBLOODED class) must hunt and kill his first 'ultimate prey' -- these creatures are commonly known to humans as Xenomorphs or Aliens. Failure in the Trial means death, while success means the Unblooded Predator is marked on the forehead with the acidic blood of a Xenomorph, making them YOUNG BLOOD class. This mark is both a symbol of respect, and a sign of membership of a certain Clan - each mark is unique to a particular Clan, and used only by this group. This symbol may be used to mark and identify a Clan spacecraft as well as ceremonial items, and is usually inscribed on the hunter's helmet in addition to adorning the Young Blood's forehead. Hunters who have held this title for an acceptable length of time are known simply as BLOODED hunters. Young Bloods are full of ambition and pride once they have collected their first trophy - the skull of their kill. 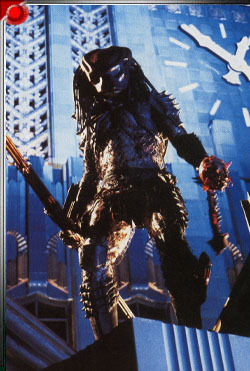 While they may seem ruthless or brutal, the Predator warrior's behavior is actually controlled by a code of ethics. This code appears similar to human warriors codes such as bushido and chivalry in that it promotes bravery, martial skill, and loyalty to the pack. Most Predator will not hunt or attack a creature it considers "weak" or unthreatening. When the Predator encounter their prey's females or young, they often spare them, considering it dishonourable to shed the blood of those who cannot defend themselves. 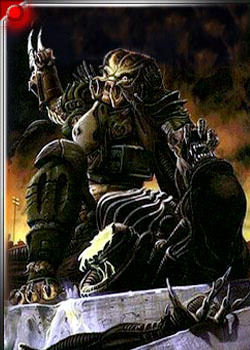 The Predator WARRIOR class are those who adhere to these beliefs and codes. The Warriors become solo hunters that use their high technology and travel the universe to find honourable hunting. When a member of another species shows a great honour, there has been a mutual respect - but a Warrior would consider this a worthy trophy. The Predator ELDER class are more reasonable. Elders are the greatest Predator that have ever lived - having survived a thousand hunts - and they consider honoured fighters of other species as respected as their own kin. Elders have often let warriors of other species live after they have proven themselves honoured warriors. This usually only occurs if the subject has killed a Predator or fought alongside in battle. There is also a common practice in these cases to maintain honour, by exchange of trophies on both sides. There has been a story of a human living in a Yautja community. This came from her fighting alongside an Yautja Elder in a hunt. When he died, the human was accepted by the obvious endorsement of a late elder. She was made a Young Blood class, and therefore, became accepted as an equal. On the other end of the scale are the BAD BLOOD of the Yautja - those who have committed crimes such as murder, dishonourable hunting or failure. If found to have brought dishonour, and the Yautja flees rather than accept punishment, there can be no forgiveness. HONOURED class Yautja (those who have earned more kills than the average hunter, and are skilled in all ways) and ARBITRATORS (Yautja law enforcement, mainly consisting of Elders who are bored with the hunt) are allowed to eliminate the outcasts on sight. Bad Bloods are never accepted back and travel aimlessly. Some are evil, hunting and slaying anything alive - even other Yautja. It is a common belief that Female Yautja are similar in appearance to males, but are overall larger and in many cases, stronger. Presumably all newborn and infant Yautja, or pups, would begin life at the same size - and with age would grow into their gender's size and shape. However, very little information is obtainable on the females actual appearance. 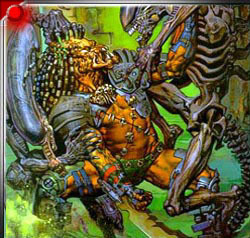 It is assumed that Yautja would be attracted to each other enough to initiate sexual relations. All senses are connected to sexual attraction, but the primitive sense of smell is most likely. Yautja can smell the musks of other Yautja, and particularly the "child-bearers musk", which would suggest that females are sexually motivated only during a specific time in their hormonal cycle. Although, human females are permanently in heat, which means they can be sexually motivated at any time - and with the Yautja lifestyle, a male could die on any hunt, so females might need to be able to breed at any moment also. Not much is known about the actual breeding period. It is assumed only one female in a pack becomes pregnant, usually the dominant female, but sometimes two or more females may breed. In other mammals, including humans, copulation occcurs in a stereotypical way, with one set of female postures and movements and a different set for the males - the only limit is imagination. Considering how ritualistic the Yautja are, this could be how they copulate. After conception and birth, daughters would stay with their mothers in the protected environment, to raise their own children and maintain dominance over their clan's territory. Mothers during this time would teach their pups to fight and survive. They are vicious and relentless in the protection of their children, who they keep safe and hunt for. Females can also hunt for trophies, but it is most likely for different reasons than the males. Dominance may certainly be a factor - but perhaps it is to show their ability to protect their territory, and their own and their sisters children, from enemy female clans. A female clan would be made of many generations of daughters, mothers, and grandmothers. It would be easy to presume that such a clan would be led by a single matriarch. Since females rule over their territory and generally run clan affairs, the Yautja would most likely have a matriarchal society. 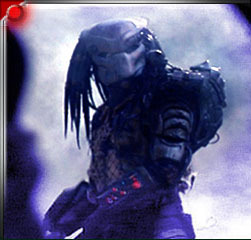 During the hunt, Predators employ a silent system of gestures to communicate with each other. This body language is very simple and only capable of relating simple messages or ideas. Pushing another's shoulder one handed is a challenge, but shaking a shoulder is a greeting. While they don't always communicate using verbal commands, the Predators create different types of basic animalistic sounds. These sounds can range from a growl (which serves as a warning or a sign of amusement) to a roar of fury. A hissing noise translates as either a warning, anger, or surprise; and a short bark can mean anger, outrage, or a command. The trademark Predator clicking growl, rumbled within the throat, can mean either pleasure or curiosity - and a clattering, trilling sound is the equivalent of Predator laughter. The head cocked to the side means curiosity or regard, but head and eyes lowered is a sign of submission. As mentioned previously, the mandibles are often used as body language. The lower mandibles spread means aggression, the mandibles flared is a sign of anger, and the back arched and mandibles flared is pure rage. The Yautja also have a complex verbal and written language. The following are Yautja words and their (rough) english translation. Dtai'Kai-dte sa-de nau'gkon dtain'aun bpi-de "The fight begun would not end until the end"
Kainde Amedha Chiva "Hard Meat Trial"
Payas Leitjin-de Hma'mi-de "Remember God's Practice"
Thin-de le'hasuan 'aloun'myin-del bpi-de gka-de hasou-de paya "Learn the gifts of all sights, or finish in the dance of the fallen gods"
And while not known to be 100% accurate, the image to the right is supposedly a translation of the Yautja alphabet. It is not known if the Yautja read from left to right or vertical, or even if they use any kind of punctuation. 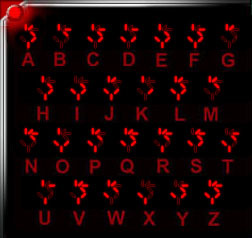 The most obvious use of this written language is seen on the Yautja hunter's wrist console.